This recipe was created in connection with my appointment as a contributor to the Nakano Natural and Seasoned Rice Vinegar. I have been compensated for my time commitment to work with their product, however my opinions are entirely my own and I have not been paid to publish positive comments. 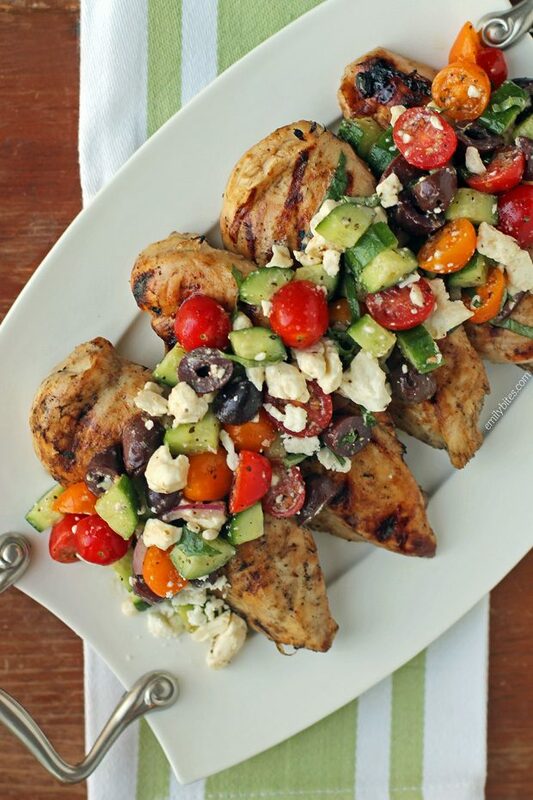 With Memorial Day just a few days away, it’s time to break out your grill for the summer (if you haven’t already), and this Mediterranean Topped Grilled Chicken is the perfect healthy recipe to kick off grilling season! The marinade is super easy to throw together in the morning and makes for juicy, flavorful chicken. The topping is really bright and fresh and it pairs beautifully with the chicken right off the grill. The combination of the warm chicken, the creamy feta, the crisp cucumbers, juicy tomatoes, salty olives and the perfectly seasoned dressing made my taste buds really happy. 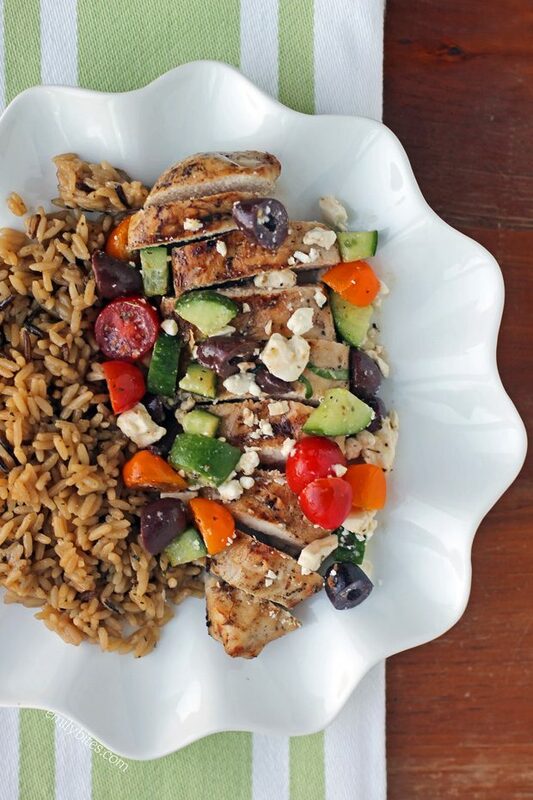 It also takes just a few minutes to toss together the vinaigrette and chop up the veggies, so this Mediterranean Topped Grilled Chicken is a really quick and easy low carb dinner. I’m really excited to start working with Nakano Rice Vinegar because they have such a wide variety of delicious and flavorful products that are super versatile. I used their Original Seasoned Rice Vinegar in both the marinade and the vinaigrette for this recipe and I loved the mildly tangy vinegar flavor (rice vinegar is “gentler” than some other vinegar varieties) and the hint of sweetness this brought to the chicken and the dressing! You could also easily swap in their Roasted Garlic variety (just omit the garlic cloves in the marinade) which is also lightly sweet but with a flavorful garlic twist! I’ll be working with Nakano on a few more recipes in the coming months, so keep your eyes peeled! I have some really great ideas and I can’t wait to work with their Citrus, Basil & Oregano and Balsamic flavored rice vinegars. If you’d like to check out Nakano Rice Vinegar for yourself, here’s a downloadable coupon you can use in stores. Who doesn’t like to save money? 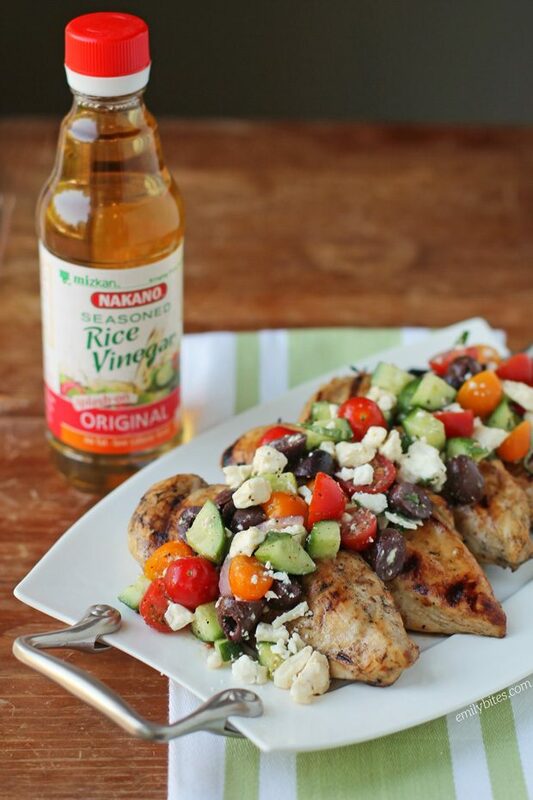 If you’d like to receive more recipes using Nakano products like my Mediterranean Topped Grilled Chicken, along with cooking tips and coupons delivered to your inbox, you can subscribe to the Nakano e-newsletter by clicking here. Also, if you haven’t yet signed up to receive my recipes by email, you can also join the Emily Bites email list by following this link! For more tasty chicken dishes, check out the Chicken Category of my Recipe Index for recipes like Pimento Cheese Stuffed Chicken, Cheddar Ranch Chicken Tenders, Cream Cheese Stuffed Everything Chicken, Hummus Chicken Salad, Bubble Up Chicken Pot Pie Casserole, Cheesy Bacon BBQ Chicken and many more! Combine all of the marinade ingredients in a gallon Ziploc bag (if you’d like you can place them all in a blender first to help bring out the flavors). Add the chicken to the bag and seal. Use your hands to massage the chicken through the bag and make sure the breasts are evenly coated with marinade. Place the bag in your refrigerator and allow the chicken to marinate for 6-10 hours, turning the bag once or twice to make sure the chicken is evenly coated by the marinade. Pre-heat your grill until hot (ours was set at a medium temperature). Remove the breasts from the marinade and sprinkle with a bit of salt to taste. Transfer the chicken breasts to the hot grill. Cook through, flipping as needed. Ours took 10-15 minutes to cook, but depending on your grill, cooking times may vary. For the topping, combine the olive oil, rice vinegar, garlic powder, onion powder, dried basil, dried oregano, salt and black pepper and stir together until well combined. Add the tomatoes, cucumbers, olives, fresh basil, red onion and feta cheese and stir until well coated. When the chicken breasts are finished cooking, divide the topping evenly over the breasts and serve. *Just a note about the nutrition information and Weight Watchers points for this recipe: If you plug the full amounts of the marinade ingredients listed into a nutrition calculator you will get different nutrition info than I have listed. Since so much of the marinade gets thrown out, I weighed the marinade before adding the chicken and then again after removing the chicken. That way I was able to calculate the nutritional values based more closely on the amount of marinade that actually gets consumed. The totals above should be pretty accurate reflections of what actually makes it onto your plate! My husband can’t stop raving over this topping – he told me I better pack my leftovers for lunch before he ate the rest of it, and then he asked me to come up with another excuse to make it. I guess it’s a winner at my house! Made this tonight and it was so delicious! I was only able to marinade it for 1 hour but it still tasted wonderful (will do the full time next time). I served with some tzatziki sauce on the side but it really didn’t need it. Really great recipe! I have Nakano All Natural Rice Vinegar on hand. Will this be just as well? If not, what can be added for taste? The seasoned version has a little brown sugar added for sweetness and I believe a bit of salt. I’m sure the one you have on hand will also work great! You could add a pinch of sugar if you’d like. I hope you love it! We just had this for dinner tonight and it was literally one of the best things I have ever put in my mouth! Going to have to share the recipe with all my friends. Thanks, Emily! What would you serve as a side? My husband would want something more…I’m fine with just this. What kind of rice did you serve with this? It all looks great and I’m excited to try it out! I made this for dinner last night. I put the feta on the side, so I could use fat free, and my husband could use regular. It was REALLY delicious! My husband and I loved the salad with the chicken, and the kids had the chicken alone. (Because they’re picky little punks) I will definitely be making this again, and I think the salad alone is going to become one of my go-to snacks. Thanks! I’m so happy you loved it! I definitely think you could freeze the chicken in the marinade. I haven’t done that with this recipe specifically but I have frozen chicken in marinade a bunch of times before and it’s always worked out great. Hi, this is one of my favorite recipes! I’ve made it a bunch of times. Do you have a guesstimate on the Freestyle points? The current smart points are listed at the bottom of the recipe!